Ted Rondeau of Grace Brethren International Missions is heading up the tour group from the Fellowship of Grace Brethren Churches that will be participating. Details may be obtained from him at trondeau@gbim.org. Grace Brethren who will be participating in the program include Dr. David Plaster, Mboi Andre, Terry White, David Guiles, and others. Translators for the event will include Dr. Roger Peugh and Rainer Ehmann. Terry White of the Brethren Missionary Herald Company is the board member who represents the FGBC, one of six Brethren groups descended from Alexander Mack’s baptism of eight adult believers in the Eder River at Schwarzenau in early August of 1708. Other groups represented on the board include Church of the Brethren, The Brethren Church (Ashland), Conservative Grace Brethren Churches International, Old German Baptist Brethren, and the Dunkard Brethren. More information about the Brethren Encyclopedia Project may be obtained online at www.brethrenencyclopedia.org. Here is a news release on the 300th anniversary, as distributed by the Church of the Brethren. Elgin, IL — The village of Schwarzenau, Germany, is the site of the 2008 Brethren World Assembly and 300th Anniversary Celebration to take place the weekend of Aug. 2-3 next year. The event is being planned by the Board of Directors of Brethren Encyclopedia, Inc. 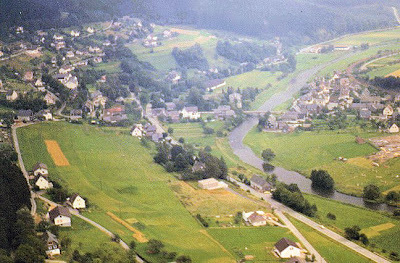 The celebration will mark 300 years since the first group of eight Brethren were baptized in the Eder River in Schwarzenau in August 1708. The Brethren Encyclopedia board has representation from the six largest Brethren denominations and faith groups that are descended from that first group of Brethren. Dale R. Stoffer, vice president of the board of the Brethren Encyclopedia and dean of Ashland Theological Seminary, Ohio, is serving as chair of the planning committee. The secretary for the board, Dale V. Ulrich of Bridgewater, Va., is serving as coordinator. –On Saturday, Aug. 2, time during the day for visitors to meditate at the Eder River, walk around the village of Schwarzenau, visit the Alexander Mack Museum–named after the founder of the Brethren, hike as Mack did from the Httental to the mill along the river, visit the castle and museum in nearby Bad Berleburg, and take a walking tour of nearby Marburg; a meal tent where a lunch and dinner will be served for a fee; an evening concert by the McPherson (Kan.) College Choir, the Schwarzenau Ladies Choir, the Schwarzenau Men’s Choir, and the Bad Berleburg Choir. –On Sunday, Aug. 3, a morning worship service at 10 a.m. with preachers James M. Beckwith, 2008 moderator of the Church of the Brethren Annual Conference, and Frederick G. Miller, Jr., pastor of Mount Olivet Brethren Church in Virginia; a meal tent where lunch will be served; a 2 p.m. Anniversary Program with guest speaker and German academic Dr. Marcus Meier, author of the book “The Origins of the Schwarzenau Brethren” to be published in English by Brethren Encyclopedia Inc. in 2008; and a 4:30 p.m. closing gathering at the Eder River. Registration for the assembly and celebration including Sunday lunch in Schwarzenau is $85. For a registration form, schedule, and more information, including a list of some nearby hotels and a map of the area, contact Dale Ulrich, Brethren Encyclopedia Coordinator of the 300th Anniversary Celebration, 26 College Woods Dr., Bridgewater, VA 22812; daulrich@comcast.net; 540-828-6548. A list of tours also is available.